This blog is written by Kateřina Janoušková, an independent certified Prague / Czech republic / Europe Tour guide. I really love Prague, I often enjoy it just by myself or with my family, walking in the hidden streets as well as visiting wellknown places, drinking all the tastes of Prague during our walks, and it makes me really happy to show this place to other people, to share the knowledge, atmosphere, beauty. You are very welcomed to join me. However, not only Prague is the place that is worth seeing in our country, there are so many of them, on one hand the most known places registered in UNESCO heritage (Kutná Hora, Telč, Olomouc, Litomyšl, Třebíč, etc…), but also other cities with fresh and living esprit. For my services you can also ask when travelling around Europe, as I visited most of the countries here on my own or guiding my friends or tourists. Thanks for your comment with nice words Laura. Prague is beautiful in winter as well. I would recommend you to walk through the city 🙂 as it is really beautiful, and if there is snow (it was two years ago, but not last year, we will see this year …) Prague Castle gardens are breathtaking. Also there will be Advent markets at lot of places, special Christmas exhibitions, concerts, lot of culture and fun. It really depends on what you like to do (music, museums, pub,…). If you want just send me an email to JaKaty@seznam.cz with info when you come and what you like and I will send you more info what’s on. thank you for leaving your trail through my blog and liking so many posts! i am honored. Hi Katy! Thanks for visiting my blog and liking my posts! I have always wanted to visit Prague – maybe someday! I like your blog very much! Thank you, Katy. Thank you for visiting my Blog and liking many posts. Your blog is also too good. I would like to visit your country one day. Looking forward for more of your country. Hello Kateřina, thank you for visiting my blog. Please comeback as I would love to show you more of California. Your pictures are fantastic. Prague has been on my bucket list for quite sometime. Thanks, I will check for news from California. Prague is must see, let me know when you are here :-). Beautiful photo’s! Thanks for ‘liking’ my circles post! My husband has been to Prague on business, and brought me back the most beautiful hand blown glass flowers 🙂 He said is was a very beautiful city, he loves it there! Now you hav to come both, so you see it on your own eyes :-), Prague really is beautiful. Hi, I have nominated you for the “One Lovely Blog” award! Here the link: http://xavigeis.wordpress.com/2012/12/14/one-lovely-blog-award/ – congrats!! Thanks a lot! I have to check what is it when I am on PC, it means next Wednesday, now I am only on phone and everything is too small for orientation for me. Thanks!! Hey, I love reading your blog and have nominated you for The Adventurous Blogger Award! Please check out my blog for details, post the award on your sidebar and spread the love to some of your favorite bloggers! Hello Katy, I’ve spent a fair amount of time in Prague and the Czech Republic and I love the city and the country. One of the best evenings out I ever had was in 1997 at ‘Na Slamniku’ in Bubeneč. I’m looking forward to discovering more about it from your blog. BTW, thanks for visiting The Naturephile and enjoying it enough to click the ‘Like’ button, I hope you’ll visit again. Thanks, Na Slamniku is rather famous place :-), I visited it few times after walks in Stromovka park. Hope you come back soon. Thank you for stopping by and liking so many posts! I will have a stroll among yours this weekend! Visiting the Czech Republic has long been a dream of mine – I will get there one day – but until I do I will enjoy your beautiful images. Thank you so much for sharing, and for stopping by and liking my recent post ‘Word a Week Challenge entry – Clouds’ – your support is appreciated! Thanks for re-visiting and liking more of my posts! Thanks, hope you will enjoy my blog as I enjoy yours :-). Thanks for following my blog, Katy! Stop by any time! Thanks for stopping by. I was in Europe this past summer, I was hoping to see your city, but alas, I ran out of time! Perhaps next time! I believe you will love it! Ahoj :-), I am very happy that you love Prague, I do to :-)! Hi Katy, thanks for stopping by my blog. I absolutely LOVED spending time in Prague this summer! A blog that makes the reader feel good about life. Beautiful words and images. Thanks for your kind words, I really appreciate them. A belated thank you for stopping by and liking my post “Ode To Merry-Go-Round and I enjoyed taking a look at yours. Regards and best wishes! I think it’s great that in the picture you are rowing. That’s cool! Katy, thank you for stopping and liking two posts this morning. Your blog provides me with an opportunity to visit Prague and the Czech Republic. Your images are beautiful and I look forward to following and visiting your blog regularly. Hi Katy, thanks for dropping by my blog:-). My husband & I visited Czech, summer of 2011. We had a wonderful time there, hosted by our friends in Nový Jičín and also had a lovely time in Prague. It was the highlight of our trip and we intend to come back for more in the near future. Hi Katy! I’m guessing you already know that I publish a digital magazine version of my blog Junsjazz Images & Inspiration of which five issues are already online. Its not a commercial magazine, just another online project of mine, an offshoot of my blogging. I plan to release the latest issue by end of February and I’d like to devote a spread for a guest photographer to showcase his/her works (probably 5 to 6 images). Some 12 photo bloggers have already been featured in the past three issues. I would be honored to have your amazing works presented in Issue #6, if it is alright with you. Of course there will be backlinks to your blog and full credit to you for all your works that may appear in the magazine. Here’s the link to my digital magazines: http://junsjazzimages.wordpress.com/digital-magazine/ I await your reply. Thanks! Happy weekend! Thanks for spending a few minutes with my blog and for the like. What an ever so amazing life you must lead in Prague. I look forward to reading more of it. Nice to have meet you, Katy …. I also must say I love your city. Stunning. My son went to Prague this year and loved the city! And the people! He said that the city itself was like a museum, the beautiful buildings not bombed in the WWII. I am happy you stopped at my place! Thanks a lot! I love your pic!!! You look like drinking every drop of life together with your coffee..
Hello Katy! I don’t know if you received my message, It probably got lost somewhere, but I requested a short write-up from you (4 to 5 sentences) a few days ago, to be placed in the magazine. Just a few info about you and what you look out for when taking pictures, stuff like that. Sorry for the bother, but please email me the write-up at jazzmanjun@gmail.com. Much thanks and have a great weekend! Your blog does inspire me! Thank you for being so close to my blog, I’m also following yours with such a pleasure! Imagine that I was never in Prague … or maybe once, but just passing and not seing anything! Hope someday I will come in this beautiful city, meanwhile I’m just enjoying your pictures! Your blog is great and I’ll be checking it out frequently. Thanks a lot I really appreciate your nomination! Thank you for visiting my blog and for the “like” you add. I have to say that I’m very interest about your country and its recent history (i.e. the split from Slovakia); may I ask anything about it in the future? Hi Katy, thanks for ‘like’ing my post Moving Forward. I look forward to following your posts and learning about Prague. My great great grandfather apparently emigrated from Prague to the US around 1860 and someday I’d like to visit. I’d also like to find what his life was like there at that time but right now we can’t find information on his name. Hi thank you for pressing like in one of my post. You have such an interesting life as a tour guide.. I hope I could visit your place one day..That would take me a lifetime to save for airfare alone. 🙂 But I keep on dreaming, it’s not bad I guess. My old school friends and I are talking about going to Prague in August this year, so I’m going to have a good read of your blog to find out information about it. Hey there. What is the horse statue about, where he is sitting on it’s tummy? A blog that has feats for the eyes in every photo posted. Love it …!!!! Thanks for visiting my blog and commenting. It’s really appreciated. Thanks for following me I appreciate it! I can’t wait to see where you take us next. Thanks for stopping by and liking my blog. I agree; Prague is on of the most beautiful cities in the world. When my dad was alive, it was his favorite. Thanks for liking “Hone” My husband took a school trip to Prague years ago. Loved it. Thanks for checking out my blog! Glad to do the same. The pictures are fantastic! Yes, I am from Prague, I was born there and I live there :-). You are come to visit the city, it is really beautiful. Ask me for tips and also guiding services :-). It depends on duration and if you want to go also outside of Prague etc, but it is for sure good price :-). Contact me via email in case you are interested: praguebykaty@gmail.com. I find the history of your town very interesting… as it happens though, I don’t travel abroad anymore. Those days are past. Enjoyed looking at your pictures though. My husband and I visited Prague in 1995. We were lucky to visit during the big push to tidy up the city after the Velvet Revolution. The city’s beauty rivals that of Paris! Thanks for liking my post on the Taj Mahal! . Prague has changed a lot from 1995, you should come and see it again, it is really beautiful :-). I would love to come again! Thank you so much for visiting my blog! I have really enjoyed my tour of your blog and its beautiful photos. While I love to travel, I am a dog so going to Europe is sort of out of the question (:-)), but my humans are quite the travelers so one day, hopefully, they will make it to lovely Prague! That would be great, if your humans will come :-). But in fact our dogs would love to meet you, they are quite travellers as well, but only by car and around Europe. They love to stay with us and travel with us, car or tent is their second home, I will give them your greetings and for sure they are sending theirs to you :-). Hey Katy, recently visited both countries, had a great time!! Found you on twitter too, cool. Prague is one of my favorite cities in the world! It is so magical in every sense of the word, I also had a lovely romance with a boy I met there 🙂 Love the blog! Thank you for checking out my Blog and the ‘like’. I have never been to Prague but I hear great things and must add it to my bucket list. Why is that man sitting and farting on the horses belly? lol. Thanks for the “like”. Hope you entered the giveaway? I LOVE, LOVE, LOVE Europe and miss it so much! Definitely will have to visit again, and next time, make a stop in Prague. Hope to bring my husband with me this time! Thanks again for stopping by my blog today! 🙂 – J.C. I know your blog already. Great writing, great picture, very inspiring!! Thanks for visiting our blog, and for the “like” on the “Why we travel” post. I am looking forward, have a nice day :-). I shall read your posts before my next visit to Prague. Wish I’d found you earlier, but it;s never too late. Good luck. HI Katy, thanks for liking my blog. Yours looks great, I’m looking forward to having more of an explore and reading lots of your posts! thanks for liking some of my photography posts at rjgreenphoto.wordpress.com. Katy, I have been to Prague and loved it! However my favorite is Cesky Krumlov! The best mural in a dining room/theater in the world I think! Thanks for visiting my site too, I have enjoyed looking at yours this morning and will continue! We have special company and committee and exams and courses in CR and also in Europe for certification. Hoping to make it to the Czech Republic one day. I travelled quite a bit in Europe but never in the Eastern countries and moved to the US before the Iron Curtain came down. Hello Katy, thank you for the follow. I read some of your blog and feel myself falling in love with Prague from a distance! It is going on my travel list for the future. Thank you for sharing your perspectives and knowledge so beautifully! Thanks for stopping by my blog! What delight to find out your write about Prague, one of the cities I plan to see! It will be fun reading your posts! Thanks a lot for your nomintation, I will answer it in my nearest Info blog (Like 100 post was). Thanks a lot for promoting my service and only one thing: I am not an expat, I was born in Prague to my Czech parents and I live here all my life :-). Thanks! Visiting Edinburgh is still only in my dreams but I would love to go! Lookin gforward to meet you in Prague. I agree :-), we always have to survive the crowdy areas (Castle, Bridge, Clock) but then I prefer hidden streets fro my clients :-), or it is good to come at about 7-8 in the morning, best time for sightseeing. Thanks for liking my latest post 🙂 Prague is a truly lovely place. Stunning architecture! Katy, thank you for discovering my blog http://www.throughharoldslens.com. It gave me the opportunity to discover, explore ad Follow your blog. Hope we both enjoy our journeys. Prague is on my bucket list. Thank you for stopping by simplydaisies! Prague is such a beautiful city! Your blog is interesting. Certainly I would use your services when I visit Prague. thanks for stopping by and liking several of my posts on my photography blog. Thanks for liking my Tales of Four Rickshaw Drives on TalesAlongTheWay! Thank you for the like! I must put Prague on my list to travel to! I worked in the airline industry for 20 years and was able to visit Prague several times. It’s an amazing place and is full of history and most importantly – great people. Thanks for sharing! Thank you for visiting my blog and liking my ‘Colour’ photos. Will be back to browse round your site. Would love to come to Prague one day. Katy thanks first of all for stopping by and liking our post. By the same token we are very impressed with your BLOG as a Prague tourguide. Your descriptions puts us right there in Prague. Thank you for sharing your beautiful city. Hi, I’ve nominated you for the Epically Awesome Award Of Epic Awesomeness following my nomination by “Charles Schnyder Photography”. Hope you can accept. You can see your nomination on my WP Blog. thanks for visiting (and liking) my blog. I do love Prague (hope to be back there by end of summer), so your insights are really more than welcome. Hello, I just wanted to let you know that I nominated you for the WordPress Family Award. You can do what you want with it, no pressure. Katy, I lost you, but am back. Just feel free to enjoy! Hey Katy, thanks for the likes on my blog. You’re great! love your photos. Gotta go to work. I’ll write an email with the details tonight or tomorrow. Thank you so much for your help! Wonderful blog! I’ll be in Prague in about two weeks, and really needed some help for what to see in the three days I’ll be there. Prost! Just wanted to say THANKS for you checking me out I’m looking forward to digging deeper into your blog – loving what I’ve seen thus far. Thanks for liking “archaeologists,” Katy. Hope some other quips fit your interests. Best to you, your blog, and your business. Prague was everything I imagined it to be …. I’d read all your posts about it and intended to visit so many of the things you have talked about, but got so easily distracted by the Charles Bridge at dawn and the quiet streets (and taking wrong turns in the dark) – I loved it all and could have stayed in Prague for weeks just to photograph things in more detail. Having seen Prague at the start of my month away and Paris at the end, I look at them as the bookends of Europe holding the whole thing together. Both equally beautiful in their own ways. Thank you for inspiring me. You live in a wonderful city. Katy, I would love to pass the award on to you – http://wp.me/p293Pw-6gE – and it’s totally up to you what ever you want to do with it – keep it all to yourself or pass it no. No must from my part. Hi Katy, I love Europe and I was in Sweden for 9 months. I wanted to visit a lot of countries including Czech Republic. Sadly I coudln’t. but I can always ‘visit’ it through your blog. Anyway I came here to tell you that my blog ‘Beyond Beauty Tips’, which you are subscribed to, is now ‘Things To Rave About’ (http://toraveabout.com). Ahoy Katy! Dyekooyi for liking my pictures of Czech Republic! It’s a really wonderful country. I had an amazing time there even though I was there in the winter. I hope to visit your beautiful country again in the future! 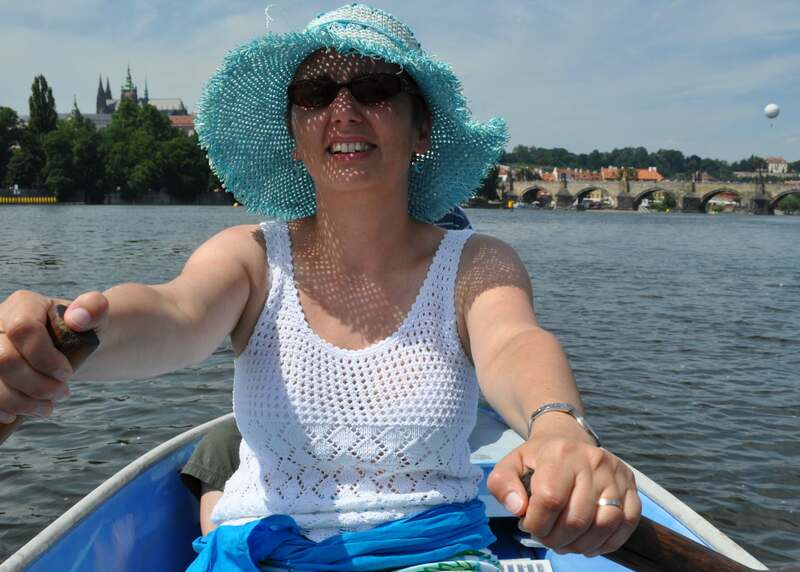 I’m followng your blog now to get updates on Prague : P.
I hear that the rain is easing in Prague and the Vltava is falling …. That is very good news. I hope you haven’t been too affected by the flooding. It would be hard to reconcile the photos I took only a few weeks ago from the Charles Bridge with the view you must have now. Thanks for following my blog. I haven’t made it to beautiful Prague yet but will look you up when it happens! Might have to be in a year or two! Hi Katy Thanks for taking a look at my blog thanks to the encouragement of Lisa decided to open, I do not speak English perfectly but since most of my follower speak English I had to put my skills into practice. Prague sounds like a dream! Really appreciate you poppin’ by my blog so often, Katy. It means alot, thank you! Thanks for the visit and like on the CARE2 site … some good reads well think of my site when you need a new Walkabout Bag! Hi Katy, You nominated me for an award back in March or April 2013, I was overwhelmed with the blogging and just trying to get used to it, so I didn’t do anything about it. I was nominated for another award and ignored that too. Today, I was nominated for the Inspiring award..I am touched and humbled. . I am finaly going to do the work and claim the award. 1. What was the award you nominated me for? 2. Is it too late to answer the questions and post the picture? Hope this is not too much trouble for you. thanks for thinking of me! I’m pretty sure you’ve got a Liebster Award already, but I’m happy to give you another today! Keep up the great blogging! I really enjoy checking in here. What a nice blog, Katy! And thank you very much for being so helpful and friendly at the post office yesterday! Such friendliness means so much when one is an alien and don’t understand the language. Hi Katy, what a terrific blog! I especially love it because I am obsessed by Prague. I love your gorgeous site layout, vivid photos and memorable stories. Keep it up! There’s a magic book written by Ripellino on Prague (‘Praga magica’) that I read before my (unfortunately only one!) visit to your wonderful city. I love Prague. And I had the pleasure of visiting with a local who took us to remote off-the-beaten track places… I’m starting to follow you today and I will certainly contact you for my next trip to Prague… By the way, I even bought a Czech grammar back then but never got farther than personal pronouns… I’m fond of Kafka, Dvorak, Leo Perutz and Mucha! Best wishes!